I don’t know if this makes me crazy or not but I really love teaching decimals. Whole numbers in 5th grade are so large and that intimidates the students. Fractions are yucko for obvious reasons. And then there are decimals. They are fun to shade in and count the tenths and hundredths in models. They are easier to relate to because of money. Kids love money, so when you relate decimals to money, there is a total buy in and those light bulbs start turning on. 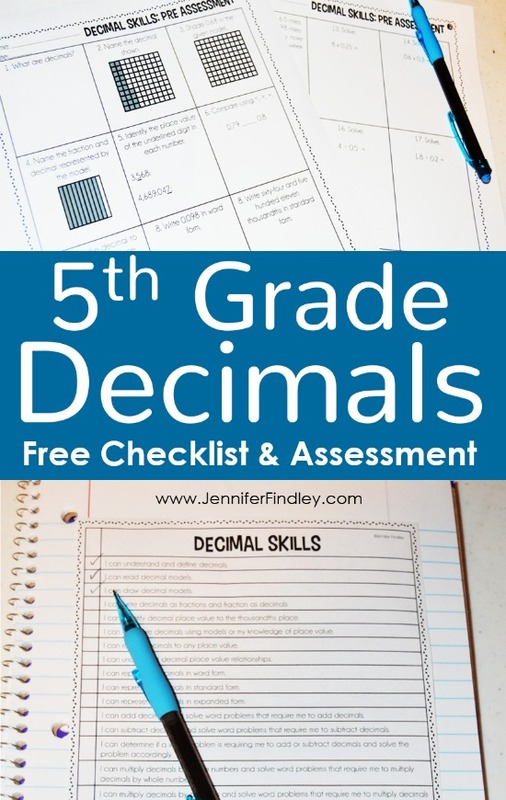 So now that you know that I love teaching decimals, I want to share a free decimal checklist (that doubles as my pacing), a free asssment to use as a pre or a post, and then my must have resource for teaching. Last year I started taking concepts like fractions and decimals and breaking the standards down into all the skills that have to be taught. After breaking the standards into skills, I created “I Can Checklists” for the students to glue into their notebooks and check off as they learn each new skill. You can grab the fraction checklist for 5th grade by clicking here. The students really seem to enjoy keeping track of what they have learned in this manner during our fraction unit so I think this will be helpful for decimals as well. As you can see the standards have been broken down into manageable chunks (which include pre-requisite/embedded decimal skills) and then rewritten in student friendly language. I use this checklist throughout my teaching unit to keep track of the skills and to help the students ownership. This is also how I typically sequence the skills so the checklist doubles as a pacing guide. Click here to read more about how I pace my math instruction and grab my pacing guide. 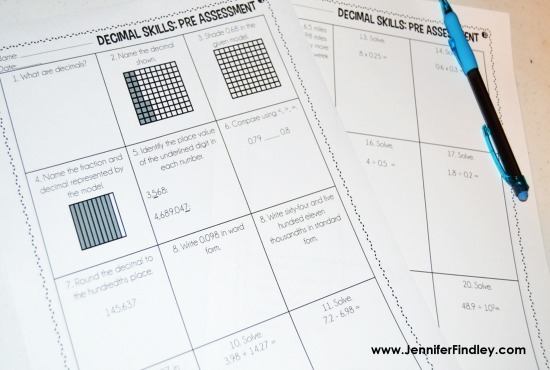 Once I had my checklist ready to go, I used it to help me create a pre-assessment for decimals that would then guide my instruction. This assessment could also be used as a post assessment. However, I will mention that it is not super rigorous. It tests their basic knowledge of each skill and does not offer any higher level thinking challenges or tricky tasks. It is perfect for a quick snapshot of what they know about decimals, if anything. You can download the checklist and pre-assessment for FREE by clicking here or on the image below. Now that I have showed you my checklist and my pre-assessment, let’s talk about teaching resources. I have a lot of resources for decimals currently in my store. You can see them all by clicking here. 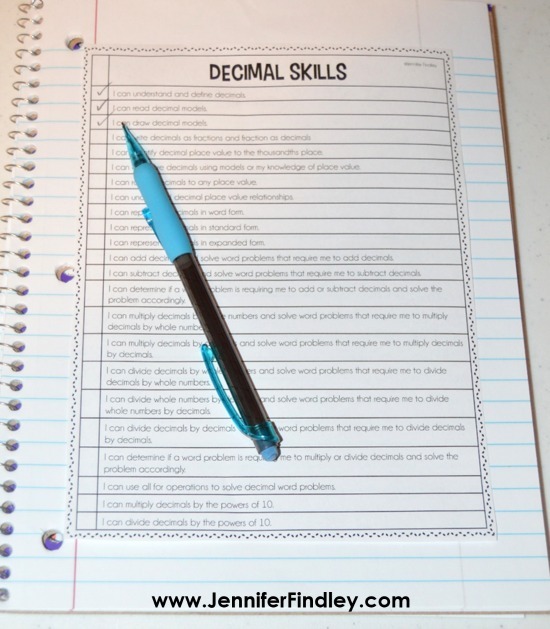 However, if I had to pick just one favorite resource it would definitely be my Complete Guide to Decimals Resource. 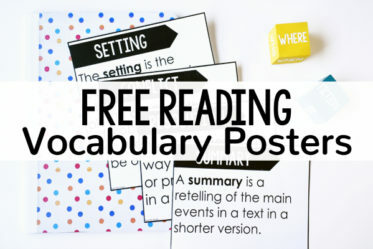 This resource is my favorite because it has a little bit of everything you need for centers, assessment, and teaching. There are SEVEN task cards sets ( and two matching centers). 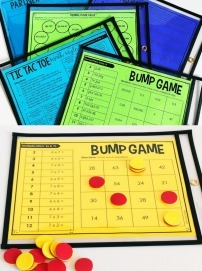 These are perfect for math centers, math groups with the teacher, re-teaching, independent work, RTI, and early finishers. They are provided in both color and black and white to provide even more options. 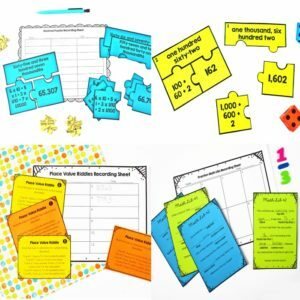 In addition to the task cards, the resource also includes 10 different printables to cover the various decimal skills. 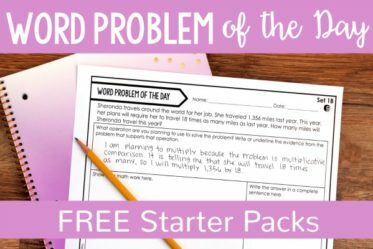 The printables can be used as independent work, homework, quizzes, etc. Finally, my favorite resources in this pack are the printable charts that help review and teach the skills. The charts are provided one to a page and four to a page. 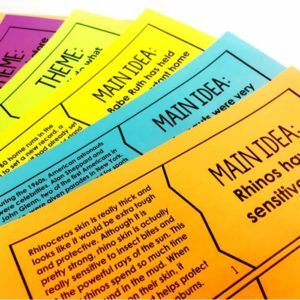 The four to a page ones are perfect for Interactive Notebook help posters. Can you see now why this resource is my favorite go to resource for teaching decimals? 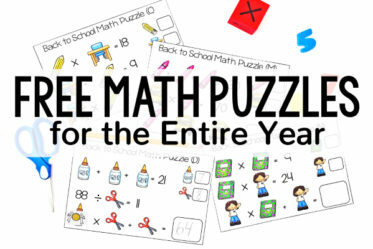 It has almost everything you need to teach all the decimal skills. 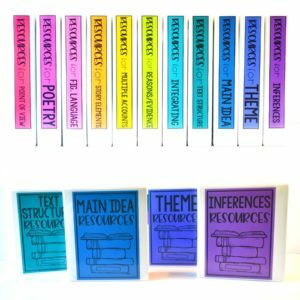 If you think this might be a helpful resources for your students, click on the link below to check it out in my TpT store or purchase it today. 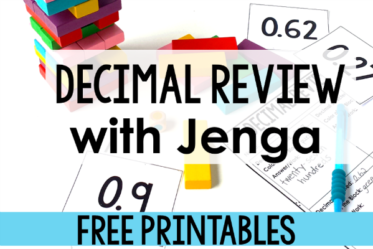 Click on the links below to grab a few more free resources to help you when teaching decimals to your 5th graders. Specifically about this post, I love the way you break down standards into “I Can Checklists.” We have discussed and studied the standards very thoroughly in my courses, and they honestly seem a little intimidating at times. Your idea of breaking the standards down into skills not only helps the students know what is expected of them, but also seems extremely useful for educators! They simplify them into a more manageable pieces that are more “friendly” to look at. I will be checking out all of your resources as I can definitely see myself using them in the near future! Hi Michelle, thank you so much for this kind note. I am so glad you found my website and that you are finding it helpful. I am very passionate about teaching and sharing my ideas with others! Good luck as you begin your student teaching. Thanks again for your kind words about my website. I greatly appreciate them! 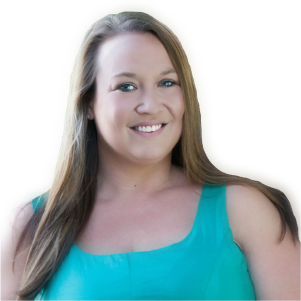 You have great resources, Jennifer! 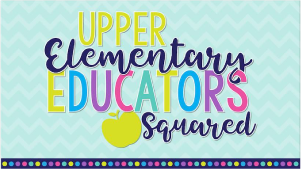 Your freebies are awesome, and I plan to make a few purchases and follow you on TPT!… As a new teacher blogger, how do you manage your time of blogging, creating resources, family time, you time, household chores, grading papers, etc.? I don’t feel overwhelmed, but I wake up early and go to bed late. Lol! I have cut out tons of TV, and I meal prep on the weekends, and my other half is amazing, but what tips do you have for managing time? Thank you in advance! Hi Krystal, it is definitely a lot of work! My oldest son has severe special needs so my husband is a stay at home dad. He takes care of all of the housework and laundry. I am also only teaching part-time this year so I can have extra time for blogging and creating and volunteering two days a week after work at my youngest son’s school. It is a lot of work, but I just try to make to do lists and stay focused and productive when I have the time. I am not sure how much that helps since my situation is different from most. Good luck though! Morning Jennifer! Thanks for getting back to me so soon. I wasn’t expecting that. Your response was perfect and helpful. I am not a huge list maker, but it seems to help a lot of other people, so I’m considering using them to help me become more productive and save time. You seem to be such a dedicated teacher and strong wife and mother. Thank you! Your scafolding of enquiring into decimals looks great. I will try with my learners. Thank you for sharing generously.